An international team of palaeontologists, including researchers from The University of Manchester, have uncovered evolutionary secrets hidden in the 100-million-year-old fossil of a hagfish – a slimy, eel-like scavenger that lived in an ancient ocean. 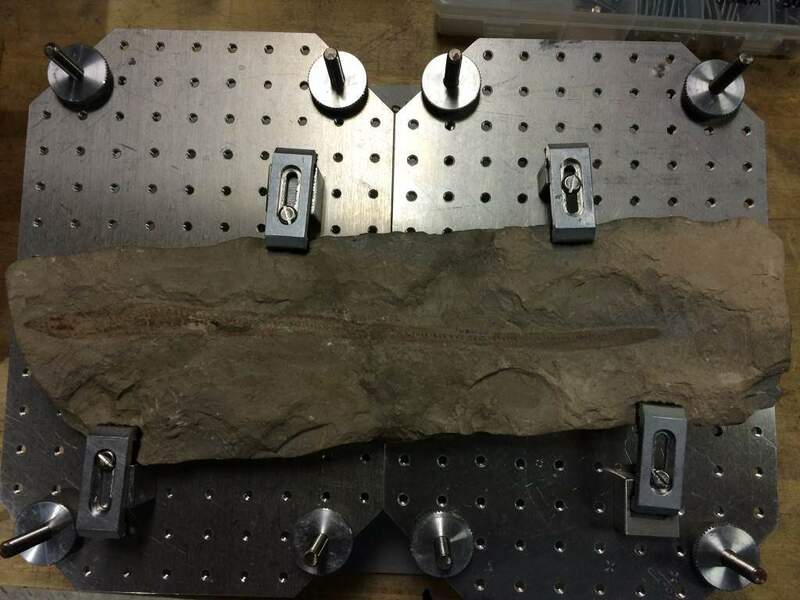 Researchers from the University of Chicago identified the first detailed fossil of a hagfish along with scientists from Manchester. The Manchester team were led by Professor’s Phil Manning and Roy Wogelius, who used powerful x-rays generated at the Stanford Synchrotron Radiation Lightsource (SSRL) (a cyclic particle accelerator) to scan a unique fossil that has helped answer questions on when these ancient, jawless fish branched-off the vertebrate evolutionary tree. The discovery is incredibly important as it changes our view of the evolutionary lineage that gave rise to modern-day jawed vertebrates, from bony fish to humans. The research is being published in the Proceedings of the National Academy of Sciences. The fossil, named Tethymyxine tapirostrum, was discovered in Lebanon and is a 30 cm long jawless fish embedded in a piece of Cretaceous Period limestone. Professor Manning, Chair of Natural History at The University of Manchester, said: “This is an extremely significant discovery as it recalibrates our understanding of the evolutionary history of all early vertebrates, an ancestral line that leads to all jawed beasties including us. Humans! Lampreys are another form of ancient, blood-sucking, jawless fish also still in existence today. These findings show that both the hagfish and lamprey evolved their eel-like body form and strange feeding systems after they branched off from the rest of the vertebrate line of ancestry about 500 million years ago. Hagfish have a unique defense mechanism in the wild to ward off ocean predators. When being hunted in the sea, they can instantly turn the water around them into a cloud of slime, clogging the gills of would-be predators, such as sharks. It was this ability to produce slime that made Tethymyxine fossil all the more important and rare. The discrete chemistry locked within the fossil could only be mapped using synchrotron-based imaging techniques developed by the Manchester/SSRL team. Manchester is an established as a world leader in the synchrotron-based imaging of fossil remains. This technique has permitted the team to identify the “chemical ghost” of the preserved soft tissue and slime glands of the fossil. Soft tissues are rarely preserved as fossils, which is why there are so few examples of ancient hagfish relatives to study. The scanning picked up a signal for keratin, the same material that makes up fingernails in humans. Keratin is a crucial part of what makes the hagfish slime defence so effective. Prof. Manning added: “This ‘chemical’ fossil has offered new and exciting evidence that has enabled a more robust reconstruction of the vertebrate family tree. However, it was only made possible through the collaboration of an international team, as Darwin once said, ‘In the long history of humankind (and animal kind, too) those who learned to collaborate and improvise most effectively have prevailed’”.